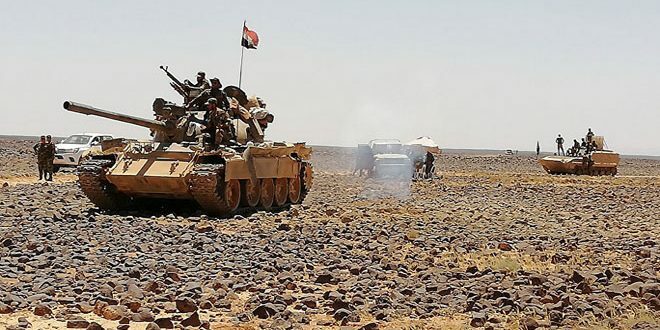 Sweida, SANA – Syrian Arab Army units continue to close in on the remnants of Daesh (ISIS) terrorists in the badiya (desert) of Sweida province, killing a number of terrorists and destroying their weapons and equipment. 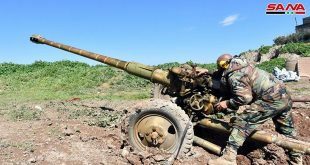 SANA’s war correspondent in Sweida said on Tuesday that army units, in cooperation with supporting forces, are closing in on terrorists in al-Safa hills area after establishing control over Oum Mardakh area northwest of the hills, targeting the terrorists’ fortified positions and movements and preventing any attempt to break through the perimeter established around them. The correspondent said that an army unit destroyed two 4WD pickup trucks equipped with heavy machineguns used by terrorists southwest of the hills. Another unit clashed with a group of Daesh terrorists that attempted to break through and attack military positions south of the hills near al-Rahba village, resulting in foiling the attack, leaving 5 terrorists dead, apprehending a terrorist, and destroying their weapons and ammo, while the remaining terrorists fled through the rough terrain towards their hideouts in the hills. Previous Lavrov: Main task now is to eliminate Jabhat al-Nusra terrorist organization after liberating wide areas of the Syrian territories from terrorism.